This table will save your back from the strain of lifting and moving your carving stone. It elevates from 10-5/8in to 33-1/4in. Also includes a long lasting, heavy-duty, all steel construction and two separate wheel brakes. Specifications: Top: 32in. x 19-3/4in. Capacity: 1000 lbs. Height: 11in. - 34-1/2in. Net weight: 180 lbs. 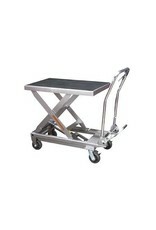 This moveable, hydraulic table cart can position and raise your work piece up to 34-1/2 in. by simply pumping on the foot pedal to the desired height. 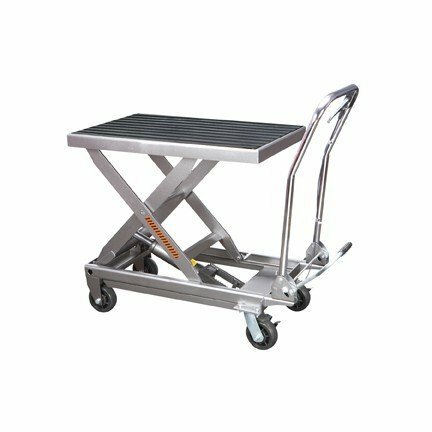 Features include a hand lever to safely lower your items and two locking swivel casters to ensure stability once the table cart is shifted into position. This table cart is great for any garage, workshop or warehouse dealing with heavy loads!